MILAN -- When Fiat Chrysler Automobiles presents its 2018-22 business plan June 1, the biggest question mark will be the future of the Fiat brand, which has been losing share steadily in its two main markets — Europe and Brazil — and is progressively disappearing in the U.S. The Fiat brand’s future in Europe will depend at least partly on an electrification of its product range led by a full-electric version of its popular 500 minicar. The 500's current electric version, the 500e, is sold only in the U.S. but the next one, due in 2021, will also be sold in Europe. Its global sales target will be 60,000 to 80,000 units a year, supplier sources said. FCA CEO Sergio Marchionne's plan for Fiat will also include shaking up its production footprint to produce the low-margin Panda minicar in Poland where costs are lower than in Italy where it is built now, Bloomberg reported earlier this month. Whether these moves will be enough to save the Fiat brand in the long term is unclear. In Europe, Fiat's biggest problem has been a lack of new products. Marchionne's 2014-18 business plan foresaw eight new models for the brand in Europe, but only five have been launched so far. Fiat will exit the small hatchback market when the Punto goes out of production in July. The new Panda minicar has been delayed by at least two years and will not be available before 2020. Fiat's main problem is too few SUVs, said Felipe Munoz, an analyst at JATO Dynamics. "If you don't have SUVs today, you can’t grow either in the EU nor in global markets, especially if your best-seller is an 11-year old minicar," Munoz said. With just one SUV and no new products in sight, Munoz expects it will be hard for Fiat to keep its current sales levels. The brand's range has only the 500X small SUV, while mass-market brands such as Volkswagen, Peugeot, Toyota, Nissan, Hyundai and Kia each have three covering various segments. Ian Fletcher, an analyst at IHS Markit, said it's difficult to forecast Fiat brand sales in Europe, given the relatively little information available so far on the 2018-22 plan and given that past plans never had been fully put in place. 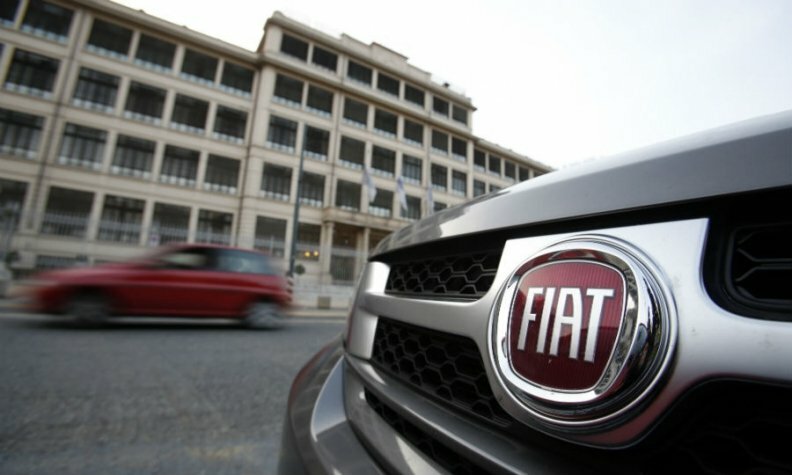 Fletcher forecasts Fiat brand sales in Europe to decline about 14 percent, to 677,029 units in 2019 from 783,769 in 2017, as no big launches are expected during this time frame. A recovery will start in early next decade on the back of the likely launch of the new 500 and Panda, Fletcher said. IHS also expects Fiat to launch a new crossover around 2020. Fiat brand was once among Europe's top-selling brands. In the 1970s and 1980s it vied with Volkswagen marque for the top spot. Last year Fiat's market share in the EU and EFTA markets was 5.0 percent compared with VW brand's 10.9 percent. Fiat was behind the German luxury brands – Mercedes-Benz had a 5.7 percent share, BMW 5.3 percent and Audi 5.3 percent, according to data from industry association ACEA. Fiat's fall has been particularly hard in its Italian home market, where sales were down 15 percent in the first four months in a flat market overall. To try to move the metal in Italy, Fiat just launched a 100 million-euro incentive campaign. Things are not going better in a Brazil, a key market for the brand. Fiat's market share slumped in the first quarter to 8 percent from 9.2 percent in the 1st quarter of 2017. For the same period in 2013, it was 22 percent. "I'm not killing Fiat," Marchionne said in March at the Geneva auto show. His strategy, though, has been to concentrate resources on FCA's premium brands such as Maserati, Alfa Romeo and particularly Jeep. In Geneva, Marchionne said "Fiat's relevance in the marketplace has gone" and that FCA needs "to make room for the emergence of the most powerful brands." In his view, the Fiat brand "has got phenomenal prospects in Latin America," but it will have a less relevant role in Europe, "where I think it will center on the 500 family." Gabriele Gambarova, an analyst at Banca Akros in Milan, recalls when Fiat brand head Olivier Francois, presenting the 2014-2018 plan, outlined two paths for the brand. One aspirational path centered on the 500 family and one was more practical and cost-conscious, led by the Panda. The strategy hasn't panned out. Instead Fiat brought to Europe the Tipo family of Turkish-built compact models to beef up its product range with an affordable model and to keep a presence in the key compact segment. "We could now imagine the cost-conscious side of Fiat morphing into a low-cost brand with production footprints in countries like Turkey, Poland and Serbia," Gambarova said. JATO's Munoz suggests that with its expertise in cheap cars, "Fiat could possibly launch a low-cost small SUV below the 500X, maybe made in Serbia or Turkey." Or maybe "they can carve up a role as a niche mainstream brand specialized in iconic cars," he said. Marchionne told analysts last month that FCA's lagging Europe, Middle East and Africa (EMEA) business will be tackled "head on" in the 2018-2022 plan. "Of all the issues that we need to deal with strategically, EMEA is the one that presents the highest level of complexity and certainly the biggest challenge because of the regulatory framework in which we're operating," he said. "There are some fundamental consequences associated with product and positioning of the brands that we need to address."